Babak Khorramdin (795-7 de enero de 838)​​ fue un persa​​​​​​ líder de los jurramitas,​ un movimiento de liberación político-religioso —considerado como un probable derivado del mazdakismo—​ que luchó contra el califato abásida en el siglo IX. Wikimedia Commons alberga una categoría multimedia sobre Babak Khorramdin. ↑ a b c d e Yūsofī, Ḡ. Ḥ. «Bābak Ḵorrami». Encyclopædia Iranica (online) (en inglés). ↑ a b Rashidvash, 2012, p. 136. ↑ Dabashi, 2012, p. 49. ↑ (en inglés) Arthur Goldschmidt, Lawrence Davidson, A concise history of the Middle East, Westview Press; Eighth Edition (July 21, 2005). 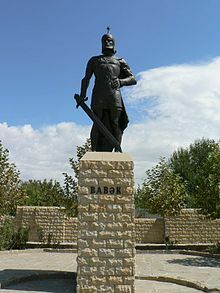 Pg 81: "...a Persian named Babak whose rebellion lasted twenty three years. Victorious in every battle, these uprisings were inspired by Persia's pre-Islamic religions, such as Zoroastrianism (The faith of Sassanid rulers) and a peasant movement called Mazdakism"
↑ Whittow, Mark (1996). The Making of Orthodox Byzantium, 600-1025. New studies in medieval history (en inglés). Londres: Macmillan. pp. 195, 203 & 215. ↑ (en inglés) Daniel Pipes, Slave soldiers and Islam: the genesis of a military system, Middle East Forum, 1981. pg 153: "Al-Mutasim undertook two military campaigns during his caliphate, the attack on Amorium (a town in Anatolia) and the suppression of the Persian rebel Babak." ↑ Bernard Lewis, The Arabs in History, Oxford University Press, 2002. pp 109-110. ↑ The Arab historian ʻAlī ibn Aḥmad ibn Ḥazm (994-1064) mentions the different Iranian revolts against the Caliphate in Al-Faṣl fi l-Milal wa l-Ahwā‘ wa n-Niḥal. The Persians had the great land expanse and were greater than all other people and thought of themselves as better... after their defeated by Arabs, they rose up to fight against Islam but God did not give them victory. Among their leaders were Sunbādh, Muqanna‘, Ustasīs, Bābak and others. ↑ «Persia». First Encyclopaedia of Islam: 1913-1936. BRILL. 1993. p. 1042. ISBN 9004097961. Dabashi, Hamid (2012). The World of Persian Literary Humanism. Harvard University Press. ISBN 0674067592. Rashidvash, Vahid (2012). «Iranian People and the Origin of the Turkish-speaking Population of the Northwestern of Iran» (pdf). Canadian Social Science (en inglés) 8 (2): 132-139. ISSN 1712-8056. Esta página se editó por última vez el 26 mar 2019 a las 17:19.